Rate this project Emmabuntus is a desktop Linux distribution which strives to be beginner-friendly and reasonably light on resources so that it can be used on older computers. The project's latest development release is based on Debian Buster, which is about to become Debian's next Stable release. The new development snapshot, Emmabuntus Debian Edition (DE) 3 Alpha, ships with a number of updates and application changes: "This Debian Edition alpha build includes the following changes, fixes and enhancements: based on Debian 10 alpha 5 'Buster'; replaced the following GNOME applications - Evince with Qpdfview, Sound Juicer with Asunder, GNOME Calculator with Galculator, Shotwell with Nomacs; removed some duplicate applications - Totem, digiKam, Brasero, Fotoxx, qBittorrent, Chromium, Evolution; removed obsolete applications - FreeTuxtv, Shutter; removed the Arduino application to reduce the distribution size ISO image size; size further reduced by deleting unnecessary language files, package information; replaced obsolete gksu with pkexec." Further details can be found in the distribution's release announcement. Download: emmabuntus-de3-amd64-buster-alpha.iso (2,973MB, SHA256, pkglist). Emmabuntus is a desktop Linux distribution which strives to be beginner-friendly and reasonably light on resources so that it can be used on older computers. The project's latest development release is based on Debian Buster, which is about to become Debian's next Stable release. The new development snapshot, Emmabuntus Debian Edition (DE) 3 Alpha, ships with a number of updates and application changes: "This Debian Edition alpha build includes the following changes, fixes and enhancements: based on Debian 10 alpha 5 'Buster'; replaced the following GNOME applications - Evince with Qpdfview, Sound Juicer with Asunder, GNOME Calculator with Galculator, Shotwell with Nomacs; removed some duplicate applications - Totem, digiKam, Brasero, Fotoxx, qBittorrent, Chromium, Evolution; removed obsolete applications - FreeTuxtv, Shutter; removed the Arduino application to reduce the distribution size; ISO image size further reduced by deleting unnecessary language files, package information; replaced obsolete gksu with pkexec." Further details can be found in the distribution's release announcement. Download: emmabuntus-de3-amd64-buster-alpha.iso (2,973MB, SHA256, pkglist). Emmabuntüs is a desktop Linux distribution designed to be user friendly and to work well on older computers. The distribution's latest release, Emmabuntüs DE2-1.03, is based on Debian 9. The new version includes Flatpak support, a Steam installation script (for the 64-bit build) and several fixes. The release announcement lists the following changes: "Added welcome and tools windows; added new and more compact post-installation dialog windows; added software installation management in Flatpak format; added control script optimizing the swap usage; added Steam installation script, only available in the 64-bit edition; added PDF-Shuffler, gscan2pdf; added screen lock app for LXDE; added shortcuts to user folders; added Bluetooth activation management, if the adapter is present; added automatic swap activation in live mode; added mounting of hard disks or internal partitions without password request; improved desktop integration; improved wallpaper management when starting Xfce; fixed Chromium icon; fixed Whisker menu; fixed links to the user directory in Cairo Dock configuration files; fixed non-functional Thunar shortcuts...." Download: emmabuntus-de2-amd64-stretch-1.03.iso (3,704MB, SHA256, torrent, pkglist). Emmabuntüs is a desktop Linux distribution designed to be run on older computers. 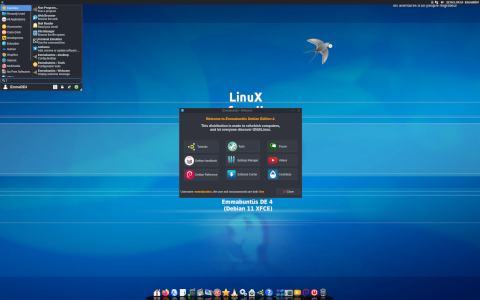 The project has released a new version based on Debian 9 Stretch featuring the Xfce desktop environment. The LXDE desktop can easily be installed as an alternative interface. "On May 21st 2018, the Emmabuntüs Collective is happy to announce the release of the new Emmabuntüs Debian edition 2 1.02, based on Debian 9.4 'Stretch' and featuring the Xfce desktop environment. This distribution was originally designed to facilitate the reconditioning of computers donated to humanitarian organizations, starting with the Emmaüs communities and to promote the discovery of GNU/Linux by beginners.This Debian edition 2-1.02 version includes the following fixes and enhancements: based on Debian 9.4 'Stretch'; addition of utilities to automatically detect and configure printer devices; addition of Shutter; addition of Darktable, but only for the 64-bit edition; addition of the LXDE installation icon within the Xfce menu; modification of the script handling the screen saver images in order for the user to be able to turn it off; update of the Wiki; updates of HPLip 3.18.4, TurboPrint 2.45, Skype 8.20 (64-bit edition only), VirtualBox-guest-dkms 5.2.10, MultiSystem 1.0423." Additional information on the new version can be found in the release announcement. Download: emmabuntus-de2-amd64-stretch-1.02.iso (3,660MB, SHA256, pkglist). Emmabuntüs is a desktop Linux distribution with editions based on based on Xubuntu and Debian's Stable branch. It strives to be beginner-friendly and reasonably light on resources so that it can be used on older computers. The project's latest release is based on Debian and includes several bug fixes along with support for a wider range of wireless network cards. "As a reminder, this version includes the UEFI support for the 32- and 64-bits architectures, and integrates the essential 'Debian Beginner's Handbook', updated for the Stretch version by our friends of the 3HG Team led by our mate arpinux, this handbook being available in both French and English versions. Also included are our latest presentation and installation tutorials already published on the Developpez.com site, as well as the one concerning the printer configuration under Debian, also available in both French and English languages. This Debian Edition 2-1.01 version includes the following fixes and enhancements: Based on Debian 9.3 Stretch. Workaround concerning the display freeze at startup bug in the Linux 4.9 kernel...." More details can be found in the project's release announcement. Download: emmabuntus-de2-amd64-stretch-1.01.iso (3,632MB, SHA256, pkglist). Emmabuntüs is a Debian-based desktop distribution which strives to offer a beginner-friendly desktop experiencing while requiring few resources. The distribution ships with the Xfce desktop environment. The project's latest release is the second version to be based on Debian and uses Debian 9 "Stretch" packages at its core. The new version ships with UEFI boot support for both 32-bit and 64-bit computers. The project's release announcement lists the following changes: "Based on Debian 9.1 Stretch. UEFI support of the 32-bit version in addition to the 64-bit. Selection script for the new wallpapers designed by our friend Odysseus Libre. Installation menu for the non-free software in the Xfce menu. Added the book of Odysseus Libre 'The square who wanted to become circular' within Calibre, both in French and English version. Updated OOo4kids to version 1.5.1, thanks to the precious help of our friend Eric Bachard. Update of the Debian beginner's handbook by our mate arpinux. HandySoft replaced by GNOME Software Removal of SuperTuxKart and Hedgewars, in order to decrease the size of the distribution." Download: emmabuntus-de2-amd64-stretch-1.00.iso (3,573MB, SHA256, pkglist). The Emmabuntüs project has announced the release of an update to the project's Debian-based edition. The new release will probably be the last to be based on Debian 8 "Jessie" as the new version, likely to arrive in September 2017, will be based on Debian 9 "Stretch". "This Debian Edition 1.03 version includes the following fixes and enhancements: Version based on Debian 8.9. Replacement of Icedove by Thunderbird. Replacement of the httpredir repositories by the FTP ones. Replacement of the now obsolete Pipelight and Pepper Flash by Adobe Flashplayer. Replacement of the now obsolete Skype 4.3 by the version 5.3, on 64-bits architecture only. Addition of the Arduino IDE. Addition of a function to change the Dock level within the Xfce menu. Addition of the French and English tutorials to configure a printer." A complete list of changes can be found in the project's release announcement. Download: emmabuntus-de-amd64-jessie-1.03.iso (3,772MB, SHA256, pkglist). The Emmabuntüs project has announced the release of a stable version of the distribution's Debian Edition. The new release is based on Debian 8.7 and features the Xfce desktop environment. The new Debian Edition of Emmabuntüs uses the Lilo search engine by default and includes support for running on computers with UEFI enabled. "This new version support our efforts even more efficiently, thanks to this three improvement axis: the solidarity, with the Lilo search engine, the reuse, by supporting the new UEFI standard during the installation, the closure of the digital divide, by giving to the beginners the opportunity to discover an accessible GNU/Linux operating system, in this case based on Debian, with the appropriate documentation. In fact, 'The beginner's handbook' published by our friends of the 3HG Team, are included in this distribution. Starting immediately and by default, Emmabuntüs uses Lilo, the alternative search engine on the web. This decision was taken for two good reasons: the actions taken by the engine to respect the privacy of the web users, and the possibility to redistribute to different associations the incomes generated by the advertising." Further information can be found in the project's release announcement. Download: emmabuntus-de-amd64-jessie-1.02.iso (3,704MB, MD5, pkglist). The Emmabuntüs project, which creates a desktop operating system designed to be run primarily on older computers, has announced an update to the distribution's "Debian" edition. The new version, Emmabuntüs DE-1.01, is based on Debian 8.5 and introduces support for the 64-bit x86 architecture. "This 1.01 version includes the following updates, fixes and improvements: based on Debian 8.5; implementation of the 64-bit variant; added the improved management of a recovery utility; added installation management utility for proprietary drivers from the SolydXK distribution; added the default re-install utility of Emmabuntüs Cairo-Dock; added mechanism for locking or not the Emmabuntüs Cairo-Dock; added full screen management in VirtualBox; added quick search in Synaptic; added Xfce Screenshooter configuration file to avoid having ':' in the default file name; added the KeepassX utility; added Wine shortcuts in Xfce and link to the installation; added a list of users to the login window...." Additional changes and features are listed in the release announcement. Download: emmabuntus-de-amd64-jessie-1.01.iso (3,653MB, MD5, pkglist).